Albert Robida (1848, Compiègne, Oise – 1926) was an illustrator, etcher, lithographer, caricaturist, and novelist. He edited and published La Caricature magazine for 12 years. Through the 1880s he wrote an acclaimed trilogy of futuristic novels. In the 1900s he created 520 illustrations for Pierre Giffard's weekly serial La Guerre Infernale. He was born in Compiègne, France, the son of a carpenter. He studied to become a notary, but was more interested in caricature. In 1866 he joined Journal Amusant as an illustrator. In 1880, with Georges Decaux, he founded his own magazine La Caricature, which he edited for 12 years. He illustrated tourist guides, works of popular history, and literary classics. His fame disappeared after World War I. These works made him another Jules Verne, often more daring. Unlike Verne, he proposed inventions integrated into everyday life, not creations of mad scientists, and he imagined the social developments that arose from them, often with accuracy: social advancement of women, mass tourism, pollution, etc. His La Guerre au vingtième siècle describes modern warfare, with robotic missiles and poison gas. His Téléphonoscope was a flat screen that delivered the latest news 24-hours a day, the latest plays, courses, and teleconferences. La Bretagne, text, drawings and 40 additional lithographies hors by A. Robida, Paris, Librairie illustrée, ca. 1900, 336 p.
Normandie, text, drawings and lithographies by A. Robida, Paris, La Librairie illustrée, undated , 331 pages, 40 additional duotone illustrations. Tome II: Bayeux, Lisieux, Bernay, Honfleur, Le Havre, Fécamp, Dieppe, Eu, Rouen, Louviers, Évreux, Vernon. Reedition: Éd. de Crémille, Genève, 1994, 169 p.
Paris, Splendeurs et Souvenirs, Éditions de Crémille, Genève, 1992, textes, dessins et lithographies par A. Robida, 824 p., 2 volumes. 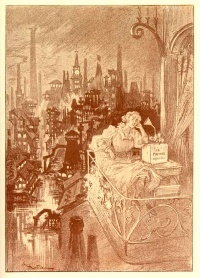 Tome 1 : Le Cœur de Paris, 412 p. Tome 2 : Paris, de Siècle en Siècledsasdasd, 412 p.
Unless indicated otherwise, the text in this article is either based on Wikipedia article "Albert Robida" or another language Wikipedia page thereof used under the terms of the GNU Free Documentation License; or on original research by Jahsonic and friends. See Art and Popular Culture's copyright notice. This page was last modified 12:50, 6 September 2013.